At Newman Family Dentistry, we offer a wide range of services in cosmetic dentistry in Indianapolis. We are committed to giving every patient individualized care and listening to their concerns. We also want to educate our patients on the services we offer and how they work. We know that with a healthy, bright smile, your confidence will go up. Giving our patients a smile they can be proud of is something we take seriously! Many adults did not have braces as teens and are considering a way to straighten teeth in adulthood. If you are an adult who doesn’t want to go through the process of metal braces, we have an alternative method of teeth straightening known as Invisalign. This product is a clear aligner that is used to straighten teeth in both teens and adults. We have found that this product is very popular among adults and can benefit them in creating the smile they want without the time commitment and hassle of braces. Invisalign is a very comfortable, nearly invisible way of straightening teeth without using conventional braces. 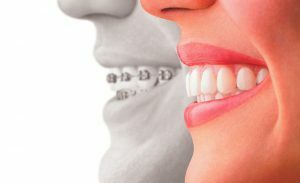 While traditional braces involve metal brackets attached to teeth. The wires are then attached to the bracket and used to shift teeth. Invisalign uses clear aligners, that are made custom to fit your teeth, which apply a gentler pressure over time to move teeth. The aligners are refitted over time as your teeth shift. The process usually involves around 8-12 aligners over a period of about 12-24 months. They are mostly invisible even when eating or talking. They are comfortable and relatively pain free. Food doesn’t get trapped between them like it does in metal braces. They can be easily taken out to clean and floss. Patients can go about their daily routine and don’t need to cut certain foods out of their diet. Patients don’t have to deal with the sometimes painful wire tightening appointments that come with metal braces. Newman Family Dentistry serves the Indianapolis and Carmel, Indiana areas. We can provide Invisalign for both teens and adults. If you are interested in getting started or to learn more, give our office a call.